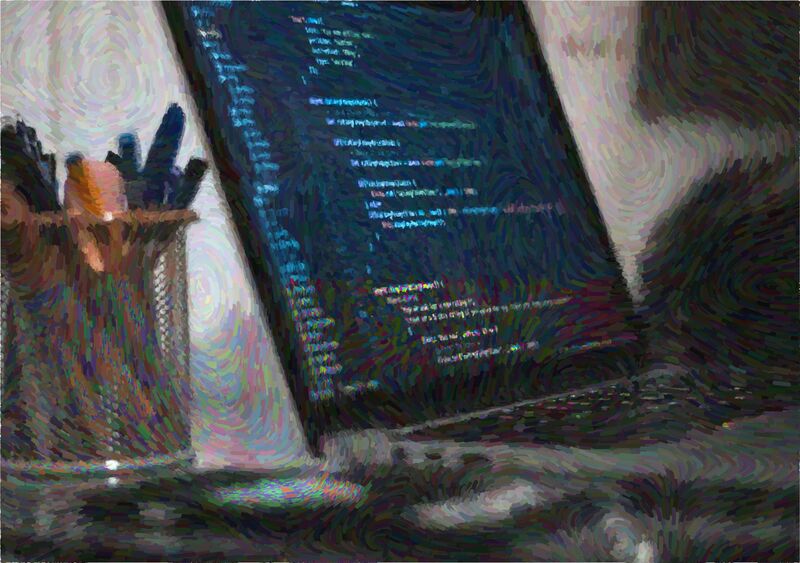 Want to make the move from a non-tech to a tech job? Here's how. Do you want to land a technical role in the engineering or data analysis departments even though most of your formal experience and skills lie over on the non-tech side of the aisle? Maybe you’re already working in the tech industry. Or maybe you are in a different industry and want to transition both industry and role. Wherever you’re at, in this article we’ll show you how to transition from a non-technical to a technical role even if you don’t have a degree, traditional job experience or formal training. In a minute, we are going to take a look at specific tactics you can use to change careers but first, let’s figure out your why. Because there are many compelling reasons to switch career tracks. Maybe you’re not satisfied with your industry, field or role. Maybe you just want a new challenge or you feel ready to pursue a career you actually want but never felt you could get. A lot of the growing, exciting fields in tech like AI, mobile, AR and VR didn’t really exist 10 years ago. Even the “established” roles like software engineer and data analyst are still relatively new. So when you were mapping out your career path, a lot of these opportunities never made it on your radar. But learning a brand new skill, being at the forefront of leading technology, getting to be one of the few to master and use these emerging skills… that excites you. And it’s a good reason to make your move into tech. Because tech jobs are highly skilled, they tend to pay well. 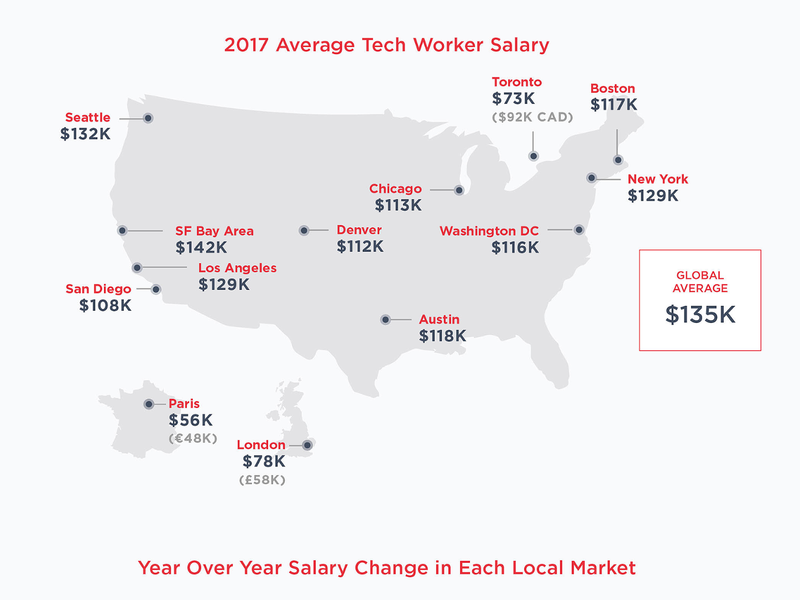 The global average salary for a tech worker in 2017 was $135k. And because the industry is growing and expanding rapidly - and we are discovering and creating new technology and applications - there’s plenty of room for growth. I don’t know about you, but when I was in high school trying to decide what to do with the rest of my life, I felt trapped. (Usually) well-meaning teachers and family members only talked about the options they thought you should pursue. And those options were often limited to the kind of jobs that were available when they were your age. And while I feel a bit uncomfortable talking about this, there was definitely a bit of “This is the type of jobs/careers/degrees people like you go into” going on. And so even if you wanted to go into tech - and master those skills - maybe you felt trapped by other people’s expectations. And now, for the first time, you feel ready to go after what you want. There are a lot of different types of jobs available in tech. Each industry (and sometimes each company) favors certain methods, programming languages and software. Because the opportunities are so many, we’re not going to talk about how to get a specific role. Instead, I’ll show you how to find the right role for you and then build up the skills you need to land it. Making a major change isn’t easy. It doesn’t happen overnight. It requires continuous, relentless commitment. Your transition from a non-technical to a technical role can take months, even years. 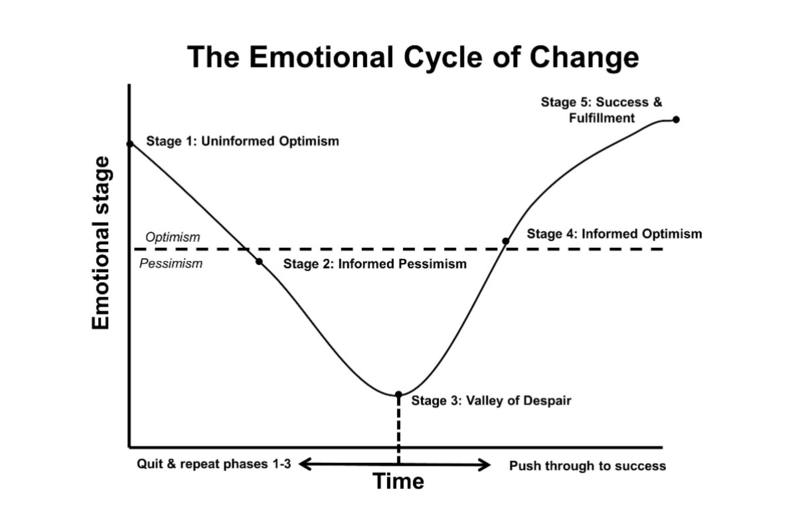 And during that time, you’ll come face to face with a fun psychological phenomenon: The Emotional Cycle of Change. This cycle happens every time you decide to make a change. It starts off pretty great. You feel excited about the new challenge and the potential end result. But then it gets hard. The end is too far in the future to really see. You’ve begun to realize just how much work this change will take… and it’s starting to take a toll on you. It took Regan Starr, an engineer at Zapier, 3 years and 8 months land his dream role on the platform team. During those first 3 years, Starr decided he wanted to work for Zapier and started a tutorial site, answering the questions Zapier’s customers were asking on Twitter to show he understood the software and was serious about joining the team. Then, when a job opened up on the customer support team, he applied. He leveraged his skills, experience and hard work to parlay that opportunity into his dream role. I’m not saying it will take you three years. But to keep going, to master the skills you’ll need to transition into a tech role, will take perseverance and time. That’s why you need to get clear on why you want this in the first place. What do you want to get out of this role? How will your life change as a result? Visualization can be a powerful tool. Olympic swimmer Michael Phelps uses it every time he enters the swimming pool. He’s not alone. This kind of mental preparation has helped high-performing athletes, entrepreneurs and C-suite execs hit their goals. So picture your end game clearly because if you don’t, making it through all the challenges along the way will be much, much harder. Gaining the skills for a new job isn’t easy. It’s an investment of time, effort, energy, money. Before you commit to a path, look at the different roles available. Speak to people who are currently in those jobs and find out what they love (and hate) about them. Speak to people at your work. Connect with them on LinkedIn. Ask your friends to make introductions to people they know. Attend industry events. Go to online conferences. Check out niche blog posts, classes, webinars, digital summits. All of these will help you find your place in the tech industry. Ideally, one that matches your strengths, interests and drives. Every career has advantages and disadvantages and going in with your eyes open will make it easier to handle the hard times. Get to know the less glamorous side of tech before you commit to it. The hours. The challenges. The work. The expectations. Once you know the type of role you’re looking for, it’s time to map out the exact skills you’ll need to land it. All the conversations you’ve been having with people working in similar positions up to this point should help with that. To get a really precise idea the skills you’ll need, take a look at the job descriptions from your dream companies and write down exactly what they’re looking for. 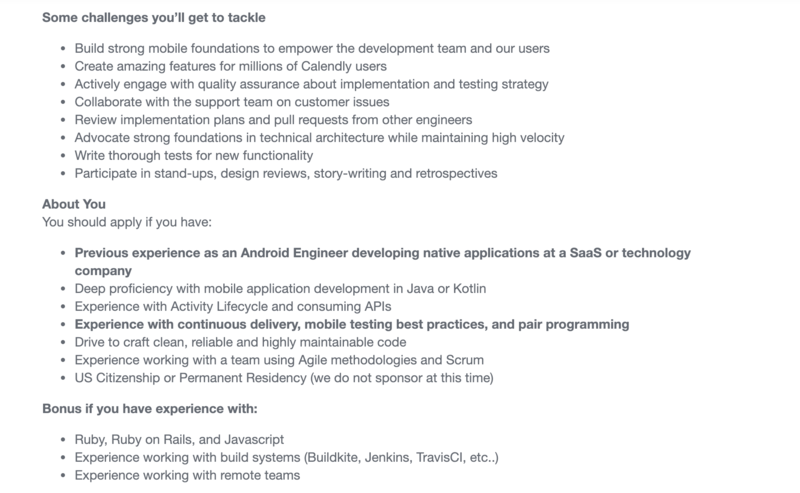 This is Calendly’s description for a Senior Android Engineer. It tells you what platforms you should master and the systems you need to learn. 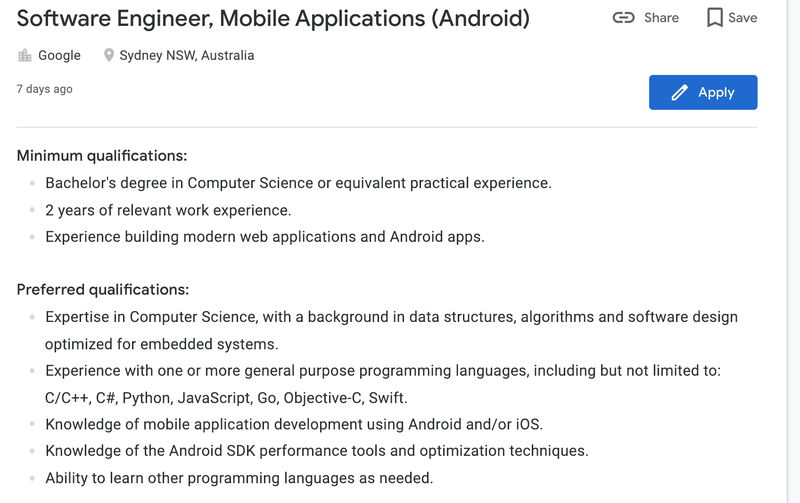 If you decided your dream job was to work for the mobile team at Calendly, you’ll need to prioritize getting experience in Java and Kotlin, working with Activity Lifecycle and consuming APIs and writing clean mobile code. Look through different job descriptions for the type of companies you’d like to work for and build your list from there. Then narrow down the skills to the most common ones and focus on mastering them first. What are the go-to tools in the sector you’d like to work in? What about the common methodologies? Getting to know those - and getting some measurable experience in them - can give you an advantage. When you shift roles, you need to learn the language your new colleagues will use. That's why it's so important to get to know what software and methodologies you'll work with. You can do this by speaking to experts in your new field, listening to podcasts and webinars, reading niche blogs or just getting involved in forum discussions. You’ve decided on the type of role you want and you know what kind of skills you need to get it. Time to start building up that skill set. There are plenty of online resources and courses that let you get started for free. You can sign up for a free course through a platform like Coursera or eDX, or get a low-cost crash course through Udemy, Skillshare or Lynda. Once you know what skills you need - and feel confident that this career shift is right for you - you can invest in a coding bootcamp, a professional or college certification or hire an expert to help you. Does the engineering department where you work need extra help? You can volunteer your time and get involved in minor projects. Have a favorite small charity that could use your help? You can offer up your time to help them with specific projects. Or you can team up with local businesses. You can also work on voluntary projects with others online and get involved in communities like the GitHub one. (Dollar Shave Club proactively source talent from sites like GitHub.) Just make sure you choose projects that help you practice and develop the essential skills you identified earlier. This isn’t for everyone. However, if you want to test out your new skills in the real world and show your future employers and team-mates you know how to apply them, you can build up your portfolio through freelancing. Go back to the skills list you mapped out and use that to figure out what type of projects you should try out, then start looking for clients that need that type of work done. Besides your technical skills, freelancing also helps you build up other core competencies like communication, teamwork and project management. The way work “works” has changed. It’s evolved. While degrees and traditional experience still matter, not having them doesn’t have to limit you anymore. You can get in that door by showing that you know what you’re doing. By showing that you’ve got the skills and you understand the company’s needs. Freelancers, contractors and entrepreneurs use this approach successfully to build careers and businesses. You can too. Unlike traditional resume-focused job matches, JobFit helps you show off your skills to your new employer by making it easy to create that custom pitch. By creating a FitStory, you can highlight the relevant experience and show initiative by outlining how you’ll solve their problems. It’s perfect for people like you who chose the road less travelled.